02/10 - Sometimes It's All In Your Genes - MSMR: What A Year! Have you ever been told to tuck your pants into your socks before frolicking in the meadow? Or have you ever had to do a "tick check" when you get back? Have you ever wondered what was so dangerous about ticks? Ticks are small creatures that belong to the same family as spiders. They are parasites, feeding on the blood of mammals and birds, and they especially like to live in meadows and tall grasses. Ixodes scapularis = deer tick In the United States, there are two main types of ticks: the dog (or wood) tick and the deer tick (pictured here). When you put on bug spray, tuck in your pants, or check yourself for ticks, you are mostly concerned about the deer tick. Deer ticks themselves are a little gross, but not harmful: however, they can carry the bacteria Borrelia burgdorferi that causes Lyme disease. And Lyme disease is bad. When a tick carrying Borrelia burgdorferi bites you, the bacteria, known as a spirochete, enters the body through your skin. Amazingly, the tick's saliva contains chemicals that temporarily inhibit your immune response, allowing the spirochete to reproduce within the layers of your skin and move outwards. As the spirochete grows inside the bloodstream, it causes a characteristic bulls-eye pattern around the infected site in about 80 percent of infected people. As spirochete numbers increase, they travel through your blood stream to other parts of your body, primarily the joints, heart, and central nervous system. Symptoms of infection at this point include flu-like symptoms, muscle pain, and joint stiffness. If left untreated, these symptoms will persist and worsen, often resulting in a type of arthritis known as Lyme arthritis. Fortunately, Lyme disease can be treated with a course of antibiotics lasting several weeks. Antibiotics are effective in the majority of people. 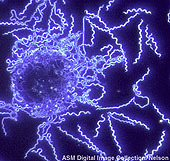 B. burgdorferi dark field illumination from the American Society for Microbiology. Antibiotic treatment needs to be given promptly after tick exposure. If it is delayed for a couple of months after tick exposure, symptoms of Lyme disease can persist despite antibiotics and you are said to have chronic treatment refractory Lyme disease (TRLA). For years scientists puzzled over why some patients continued to suffer from the symptoms of Lyme disease despite antibiotic treatment. The current hypothesis is that in these patients, the bacterial infection has elicited an autoimmune disease. In a normal immune response, the immune cells called T cells are stimulated to produce interferon gamma that is supposed to regulate your immune response. Other immune cells, called B cells, are stimulated to produce antibodies to fight the invading foreign body. But something can go wrong: in an autoimmune disease, the immune system launches this attack against a protein normally produced by your body itself, known as a self-protein. Dr. Brigitte Huber, an immunologist at Tufts Medical School, hypothesized that in the case of Lyme disease, the bacteria mimicked this self-protein. In this case, antibiotics will not relieve the symptoms of Lyme disease because, even though the invading foreign body disappears, the immune system is still attacking the self-protein. And it cannot stop. In order to prevent chronic Lyme disease, then, we need to understand why an infection by Borrelia burgdorferi sometimes becomes chronic despite antibiotic treatment. Dr. Huber thinks she has found the answer. The key lies in one particular allele of a Human Lymphocyte Antigen (HLA) gene. Let’s start with the definition from Biology-Online.org: An allele is "One member of a pair (or any of the series) of genes occupying a specific spot on a chromosome that controls the same trait." A trait could be blood type, curliness of hair, or susceptibility to poison ivy, for example. Typically, for a simple trait, you’d get one allele from your mother and one from your father. Usually, one allele is characterized as dominant and one as recessive. If either parent contributes the dominant version of the allele, you'll have that trait (e.g., freckles). If both parents contribute the recessive version of the allele, you'll have that trait (e.g., color blindness). Here’s an example from botany at About.com: "The gene for seed shape in pea plants exists in two forms, one form or allele for round seed shape (R) and the other for wrinkled seed shape (r). …Round seed shape (R) is dominant and wrinkled seed shape (r) is recessive. Round: (RR) or (Rr), Wrinkled: (rr)." But genes influence more than how you look: they oversee how your body behaves. There are lots of genes handling lots of things in your body, including the production of various proteins. In particular, there is a family of HLA genes. The National Institutes of Health explain HLA this way: "The HLA gene family provides instructions for making a group of related proteins known as the human leukocyte antigen (HLA) complex. The HLA complex helps the immune system distinguish the body's own proteins from proteins made by foreign invaders such as viruses and bacteria." Dr. Huber began her research into the genetic mechanisms behind Lyme disease by looking at the genes of infected patients. In particular she looked at the HLA genes because they are known to encode genes that determine an individual's response to antigens. She found that patients who developed chronic Lyme disease had a different allele of the HLA-DR gene than those who recovered with antibiotic treatment. Specifically, those with chronic Lyme disease had the HLA-DR4 allele, whereas those who recovered had the HLA-DR11 allele. Based on these observations, Dr. Huber predicted that the HLA-DR allele type was an important indicator of whether an infected person would develop chronic Lyme disease. In order to test her hypothesis, Dr. Huber used the transgenic technique to insert human genetic material into mice. These transgenic mice had identical genetic information, except for one human gene known as a transgene. Some of the mice had the human HLA-DR4 transgene and some had the human HLA-DR11 transgene. Dr. Huber then infected the mice with the spirochete that causes Lyme disease. She wanted to see if there was a difference in the immune response between the two genes. Dr. Huber found that the mice with the HLA-DR4 allele produced lots of interferon gamma and no antibodies to the spirochete. In contrast, the mice with the HLA-DR11 allele produced lots of antibodies but no interferon gamma. In other words, simply the presence of the DR4 allele was enough to trigger an inflammatory immune response. All of the other genetic information in the mice was exactly the same. "This was quite a shocking result," Dr. Huber recalled. "We did not expect this all-or-nothing response." It appeared from this first set of experiments that the inflammatory response could be traced back to a single allele of the HLA-DR gene. Previous experiments had shown that mice with the HLA-DR4 allele developed chronic Lyme disease when infected with the live spirochete. Despite antibiotic treatment, the mice still developed joint swelling, a characteristic symptom of human Lyme disease. As a result of the experiments, Dr. Huber predicted that if you infected mice carrying the HLA-DR11 allele with the spirochete, they would not develop an infection. To test this prediction, Dr. Huber infected HLA-DR11 mice with the spirochete. Once the mice developed symptoms of Lyme disease, they were treated with antibiotics. As soon as the mice were given antibiotics, the symptoms of the disease disappeared. The results of these experiments confirmed the previous results that the development of chronic Lyme disease depends on the presence of the HLA-DR4 allele. Why is this particular gene so important? The DR allele is responsible for presenting the antigen to the T cells for an immune system response. When the antigen is presented to the T cell in the context of the DR4 allele, T cells are stimulated to produce interferon gamma, an inflammatory response. In contrast, when the antigen is presented in the context of the DR11 allele, it stimulates the production of antibodies, a response that does not induce inflammation. The antibodies bind to the bacteria and eliminate it. So somehow the presence of either the DR4 or DR11 allele determines the T cell response  whether to produce interferon gamma and launch an inflammatory attack or to produce antibodies to the antigen, instead. In the case of DR4, once the immune response has begun, it is self-perpetuating because interferon gamma will stimulate T cells to produce more interferon gamma. Thus the initial immune response determines the outcome of the disease in the long run. Interestingly, the HLA-DR4 allele has also been implicated in the development of rheumatoid arthritis. Dr. Huber expects that rheumatoid arthritis is caused by an autoimmune response similar to the body's response to Borrelia burgdorferi infection, but additional research is needed to confirm this hypothesis, because no infectious agent has been identified so far that would cause rheumatoid arthritis. Since we cannot change our genetic information, future research for Dr. Huber focuses on blocking the immune response. If you could find the self-protein inducing the autoimmune response, it would be possible to make a similar protein that would block the response. There are already anti-inflammatory antibodies being used to treat other diseases such as rheumatoid arthritis. If there was a way to stop interferon gamma from binding to its receptor, it could prevent the development and propagation of an inflammatory immune response. This could be tested using a mouse model in two ways. First, you could take a DR4 transgenic mouse, infect it with the spirochete, wait for inflammation, and then administer interferon gamma antibodies to see if they prevent the development of the disease. Second, you could make a mouse model that lacked the gene for the production of interferon gamma, known as a knockout mouse. Based on Dr. Huber’s hypothesis, one would predict that a mouse that could not produce interferon gamma would not develop Lyme disease when infected with the spirochete. Dr. Huber hopes that her findings will lead to the eventual treatment and cure of chronic Lyme disease. Dr. Brigitte Huber is a Professor of Pathology at Tufts University Medical School. She became interested in the immune system as an undergraduate student because it was the newest and most exciting field of biology at the time. She enjoys doing research because things are always different and she learns new things every day. "There is still so much to be learned about the immune system and the human body in general," she remarked. When not in the lab, Dr. Huber loves to garden  she even has a winter garden in her house. She also enjoys doing yoga, skiing, hiking, and exploring. Iliopoulou, B., J. Alroy, and B. Huber. (2008). "Persistent Arthritis in Borrelia burgdorferi-Infected HLA-DR4-Positive CD28-Negative Mice Post-Antibiotic Treatment." Arthritis and Rheumatism, 58(12): 3892-3901. Iliopoulou, B., M. Guerau-de-Arellano, and B. Huber. (2009). "HLA-DR Alleles Determine Responsiveness to Borrelia burgdorferi Antigens in a Mouse Model of Self-Perpetuating Arthritis." Arthritis and Rheumatism, 60(12): 3831-3840. All content on this site is © Massachusetts Society for Medical Research or others. Please read our copyright statement — it is important. Sign Up for our Monthly Announcement! Subscribe to all of our stories! What A Year! is a project of the Massachusetts Society for Medical Research.